Inspired by the likes of Deadmau5, Skillrex, Moguais and FeedMes come the latest release from the sample wizards at Prime Loops “Complex Electro Synths” – allowing you to travel freely from doomed Dubstep to itchy Electro and back again with 400MB+ of dubstep infused electro synth loops, fragmented lead hooks, wobble bass samples, chopped-up sound FX and much more. The massive “Complex Electro Synths” sound pack brings you over 200 complex 24Bit synth loops and bass samples, delivered at Bpm rates of 122 all the way to 132. Forceful attacks meet up with ultra-low bass frequencies, analogue synth soundwaves, FX, and more all arranged over 25 construction kits for Electro Dubstep, Main Room, Complextro, House and more to give you all you need to create some serious havoc on the dancefloor. 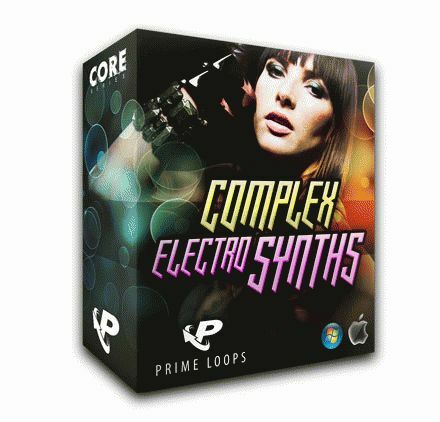 As with all other Prime Loops releases all sounds have been mastered to perfection for all major music hard- and software programmes and all synth and bass sounds in this pack come 100% royalty-free. You can use all of these electro synth samples and complextro loops in “Complex Electro Synths” for your tracks as a whole or hack and slay away at the lot of them according to your tastes. Simply drag and drop these sounds into your production and get ready to get creative. Formats include: .WAV, Ableton Live Pack, Garageband, FL Studio, Motu Mach Five, Reason Refill and more!